Reminiscent of deep blue, Mediterranean waves flirting with the golden sands, this necklace is a showstopper. 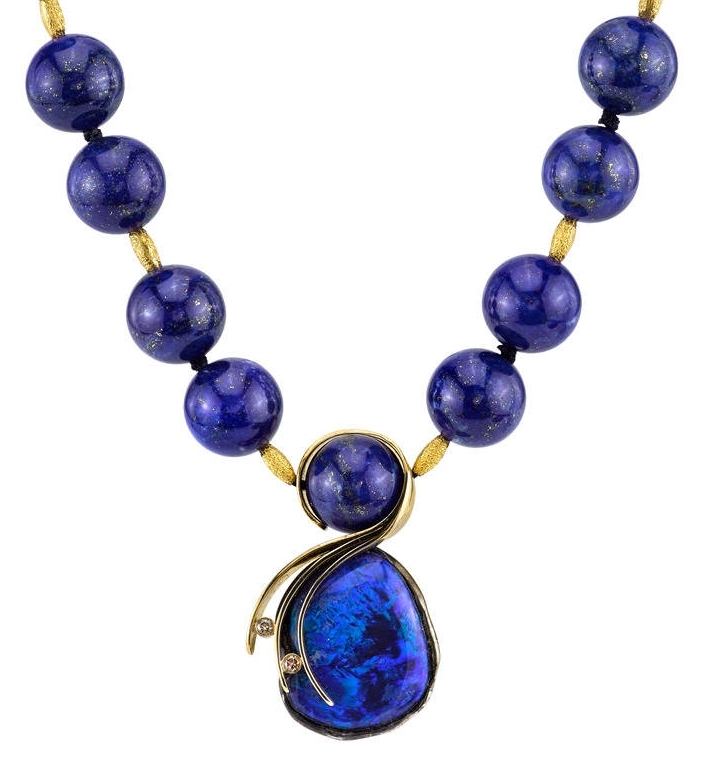 An extravagant Lightning Ridge Opal hangs from an 18 Karat Yellow Gold chain studded with natural Lapis Lazuli beads. The pendant, accented with 20 Karat Yellow Gold and White Diamonds, is a work of art within itself. The name Opal comes from "opalus," which means “to see a change in color”. Opals range in color from milky white to black with flashes of yellow, orange, green, red, and blue. An opal's beauty is the product of contrast between its color play and its background. Opal is a formation of non- crystalline silica gel that seeped into crevices in the sedimentary strata. Through time and nature's heating and molding processes, the gel hardened into the form of opals. The opal is composed of particles closely packed in spherical arrangements. When packed together in a regular pattern, a three-dimensional array of spaces are created that give opal its radiance.